I'm linking this over to The Butterfly Effect, where they are talking about art and story telling. I love the two together and my paintings often surprise me and come with their own stories. Lady Beth is the daughter of a merchant, a relatively new class in Elizabethan England. She is not entitled to the "Lady", however, Beth so longs to be part of the Nobel Class, her mother has endowed her with this term of endearment simply because it makes Beth happy. Although her family is wealthy, she will never be invited to attend court. Money does not equal nobility. Beth's father owns the largest, most prosperous woolen mill in all of England. Lady Beth has a private tutor and learns about many things not normally taught to a woman, however she will never be allowed to study at a University or work outside the home. Beth adores her lessons in art and art history. She is passionate about creating. She longs to do more, to be an artist selling work like men are able to to. By day, Beth spends her time in a beautiful upstairs studio overlooking the sea, playing and allowing her imagination to take her where it will. By night she sleeps in her magnificent hand carved mahogany four poster bed, on the new feather mattress which has replaced the one made of straw. These beds are something which were not in existence prior to this time. They are highly valued. The bed will be part of the dowry which she will take to her marriage. It will no doubt be listed in her last will and testament, as it is considered a very valuable item. Lady Beth is still young, however soon her parents will be looking for a suitable marriage which will expand the holdings of the woolen mills, make a powerful union both for Beth and for the finances of the family. Beth will always obey her husband. She will bring a dowry to the marriage and forever be his 'possession'. She will have absolutely no rights in law. Beth's parents love her very much and are aware of these misfortunes. They seek a kind, gentle, and prosperous gentleman from a good family with massive holdings, who will love and cherish their daughter. But for now, Lady Beth is in no danger. She walks by the sea with her companion, collecting shells and feathers and rocks, which she takes home and magically turns into pictures. Her work is stacking up, and her personal maid has had to put some of it into storage in order to make room in the studio for Beth to work. Everything is still done by hand, and Beth has a small band of women who sew for her. Beth designs, the women spend the day stitching. Her closet contains some stunning dresses. And then there is the jewelry. She makes her own, and in fact made the jewels which adorn her hair in this portrait. Cook is particularly fond of Lady Beth, brings her snacks during the day, and generally spoils her. In return, Beth teases Cook without mercy, switching spices in their bottles and hiding food from the larder. Beth also sews cook jaw dropping aprons, the likes of which have not been seen in these times. I could go on, however, you get the drift. :o) Lady Beth is young, happy and full of a little mischief. I hope you like her portrait. PS How's the erosion bundle doing? I would like to spend a few days immersed in Lady Beth's lovely life! I love your picture of Lady Beth and her lovely story. The painting is gorgeous......absolutely wonderful. I hope today brings you happy times and great smiles. I love that you have a story for your paintings! What a wonderful idea ! Great job! 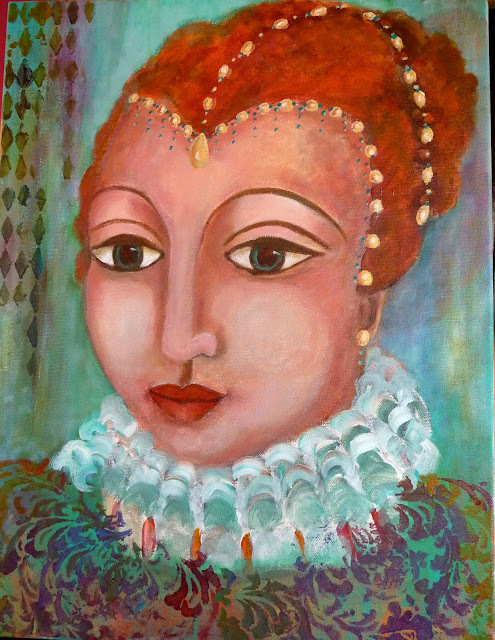 Your story could be a very true version of life as portrayed in your painting of Lady Beth. I know there were women of the court who were spoiled and favored over others. I think you should write a book as well as paint, Donna. I love to read what you write so easily. Lady Beth is fabulous with jewels and all. That was a great read! I would love to read her life story. :) She is gorgeous! Oh I want to hear and see more of Lady Beth, so interesting and dreamily wonderful! That's a very involved and delightful story and the painting illustrates it perfectly! Happy Holidays! I remember this story. :) She is wonderful!